I can’t tell you how pleased I am to let you in on the No. 1 wine of 2017 from the largest circulated wine journal in the world, Wine Spectator. Duckhorn Merlot 2014 ($98) from Three Palms Vineyard was perfect for two big reasons. It comes as Napa Valley is working hard to come back from the recent horrific fires that burned more than 240,000 acres in Napa and Sonoma, more than the size of Manhattan in New York City, with 42 deaths recorded. Wine Spectator’s No. 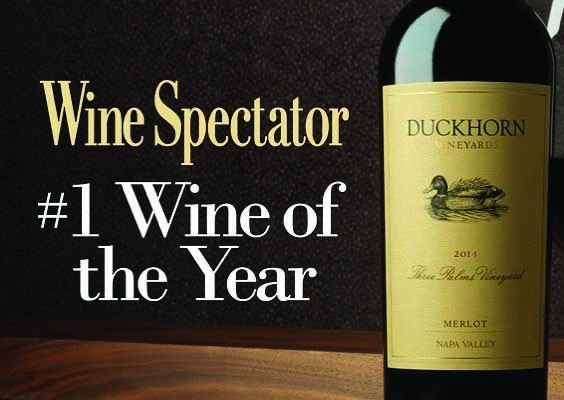 1 wine for 2017 is a Duckhorn Merlot 2014 from Napa Valley. The second is the Merlot varietal, which has had a hard 10 years since “Sideways” the movie sliced and diced this historically iconic grape. 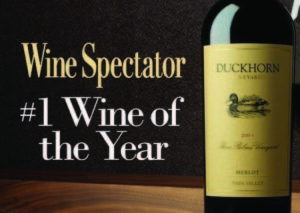 Duckhorn was founded in 1976 with its first Merlot made in 1978 as their signature wine. Nearly 16,000 wines were blind tasted this year as reported by Wine Spectator, which named the top 100 to make the cut. “The wines featured in our top 100 list capture the character of the past year and exemplify the quality and diversity the wine world has to offer,” said Marvin Shanken, editor and publisher of Wine Spectator. Winemaker for Duckhorn is Renee Ary, who started in 2003 at Duckhorn just north of St. Helena. The rest of the Top Ten include: K, Syrah 2014 Washington, Chateau Coutet 2014 Bordeaux France, Casanova di Neri 2012 Brunello di Montalcino Italy, Chateau de St Cosme 2015 Gigondas France, Domaine Huet 2016 Loire Valley France, Chateau Canon 2014 St. Emilion France, Meyer 2014 Cabernet Sauvignon, Napa Valley, Pahlmeyer 2015 Chardonnay Napa Valley and Booker 2014 Oublie Rhone Blend, Paso Robles. The full top 100 list of winning wines can be viewed at top100.winespectator.com or in the magazine’s Dec. 31 issue on newsstands Nov. 28. To fully understand the history of wine and its powerful influence on centuries of cultures, one needs to go back to where wine was recorded as being first made, some 8 ,000 years ago. A recommended place to be is Chateau Mukhrani in the Tbilisi district of the Republic of Georgia. The wines in this part of the world are very different than expected with some a bright orange in color, made in clay vessels called qvevri, holding up to 10 tons of grapes and buried underground for maximum aging. Chateau Mukhrani is a traditional castle and cellars with beautiful gardens and vineyards. 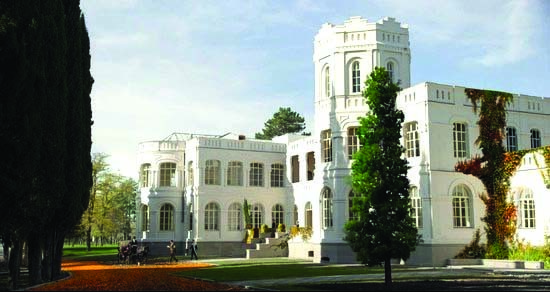 In 2002, a group of businessmen led by leading distributor Frederik Paulsen, began a profound restoration of Chateau Mukhrani, improving it to its former glory, combining modern and traditional methods of Georgian wines for the world to taste. Fascinating local varietals and at times Cabernet Sauvignon can be found. Local names include Rkatsiteli and Mtsvane are whites, and the local red is Saperavi, a dark-skinned, pink fleshed grape. See more of this historic wine story at chateaumukhrani.com. • My friends Jim and Bill Tobin at North County Wine Company have a couple of don’t miss events coming. On Dec. 1 and Dec. 2, their annual holiday Top Shelf Wine Event includes names like Paradigm, Pahlmeyer, Plumpjack and Caymus Special Selection and will be awesome. Cost is $40. Then on Dec. 15 and Dec. 16, NCWC will unveil their top 10 wines for the year, and for tasting. For more info, call (760) 653-9032. • A Batasiolo Wine Dinner will be presented at Osteria Romantica from 6:30 to 9 p.m. Dec. 7 in La Jolla. These are Piedmont Italian wines of the finest quality. Stefano Poggi will moderate the story and introduce the wines with this four-course dinner. Cost is $45. Call (858) 551-1221. • Capri Blu in Rancho Bernardo has an Italian Antinori wine dinner at 6 p.m. Dec. 6. 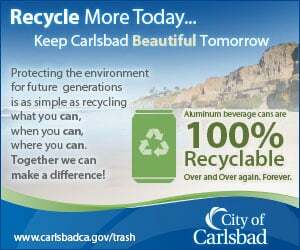 Check out the details at (858) 673-5100. Frank Mangio is a renowned wine connoisseur certified by Wine Spectator. He is one of the leading commentators on the web. View his columns at thecoastnews.com. Go to menu then columns. Reach him at mangiompc@aol.com.